Skiing season is among us and what better way to enjoy the season than checking out one of the two top ski and snowboard locations in the country? Beaver Creek and Vail are both popular for their luxurious accommodations and beauty, but which one is best for the family? Vail is the holy grail of family skiing in the United States, and potentially in all of North America. Beaver Creek on the other hand, acts like a sister resort to Vail, though it is not lacking in amenities or fun. Located only 13 miles from one another, it’s fully possible to ski both mountains during a single family trip. However, if you’re looking to arrive and plant yourself at a resort, there are a plethora of reasons and features that may help you determine which resort is the best fit. Beaver Creek is known for its family friendliness. The mountain is easy to navigate with children and has six “Kids’ Adventure Zones.” In comparison, Vail has 13 “Kid’s Adventure Zones,” but they are not all the same level of ease. If you have young children tagging along for the trip, Beaver Creek may be your best bet. If you have adventurous and capable teenage and young adult children, then Vail is likely to be your preferred destination. Beaver Creek Resort is also considerably smaller than Vail, comprising an area of 1,832 ski acres. Vail covers a ski area of 5,289 acres. If your family is looking to get into a bit of a routine on the mountain then maybe Beaver Creek is for you. If your family is looking to cover lots of ground and constantly find new trails and ways around the mountain, Vail could be your resort. Both mountains are chock full of a variety of activities. Both mountains have trails called Ski-cology runs. These trails are guided by signs that educate skiers about the local environment and wildlife. Education on vacation is a fantastic way to keep the family engaged! Not interested in the wildlife? That’s fine because there are also opportunities to go cross-country skiing, snow-shoeing, dog sledding, snowmobiling, and snow tubing. Neither mountain disappoints in the activities category. With that in mind, what is the real difference between the two locations? Vail is considered to be a pedestrian-friendly village. Beautiful hotels and resorts dot the village and are accompanied by luxury shopping and top fine-dining restaurants. The nightlife is nothing crazy but there is a bar scene for the adults looking to post-game their mountain runs. Beaver Creek on the other hand, is more of a residential environment. 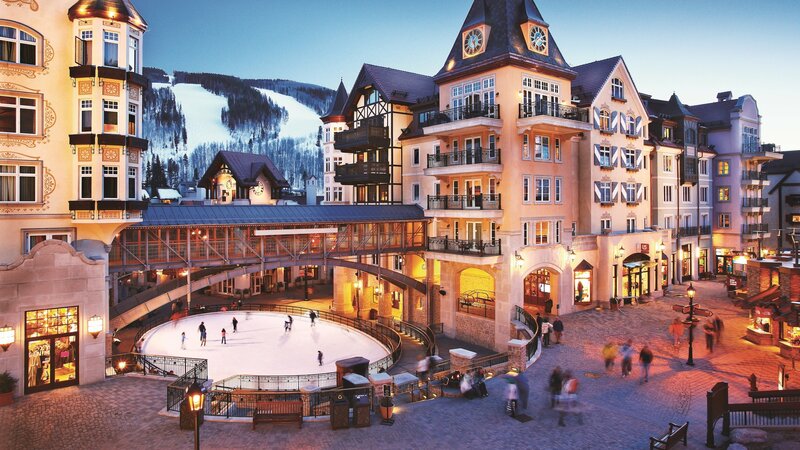 For families looking for a low-key, yet exhilarating trip, Beaver Creek is well suited. The village centers around a skating-rink, an activity not present at Vail. Also, Beaver Creek’s lodging, hotels and condominiums, are scattered more widely among the the ski runs, many with ski-in and ski-out access. Beaver Creek has a more intimate, tight-knit feel for families because of its layout, thought Vail is more of a bustle for those looking for constant excitement and activity. Neither mountain village is lacking in the food department. Both villages are laden with fine-dining, with most family meals amounting to a couple hundred dollars. Reservations are recommended for most meals, especially the dinner hours. The local palate is present throughout both mountains, providing lots of gamey food and seafood. Both villages also have a pizza restaurant, Blue Moose Pizza, for those who do not wish to spend a couple hundred dollars on a family meal. Depending on the members of your family and the goals of trip, either mountain is well suited to entertain. For the younger families and those families looking for a cozy family experience, Beaver Creek is recommended. For older families looking for non-stop excitement and nightlife, Vail is likely the better of the two. Either way, fun will be had and memories will be made.